Chai Tea French toast will totally jazz up your brunch menu. 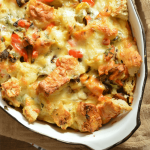 This classic brunch dish is infused with the spiced flavor of chai tea, and it’s SO good! 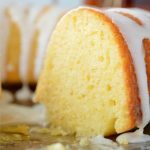 I originally wrote this recipe for my friends at Food Fanatic. It was sponsored by Dreamfarm, a company that makes the most awesome cool hybrid kitchen tools. I love working with companies like this because it lets me share fun things I think you guys will use and love. Obviously all the words are my own. Because that’s how I roll. There’s just something about Mother’s Day that makes me want to brunch all the food. Like my obsession with breakfast gets exponentially more urgent in April and May and then I brunch burgers, enchiladas, BLT’s, Brussels sprouts… we could really be listing brunch recipes all day. 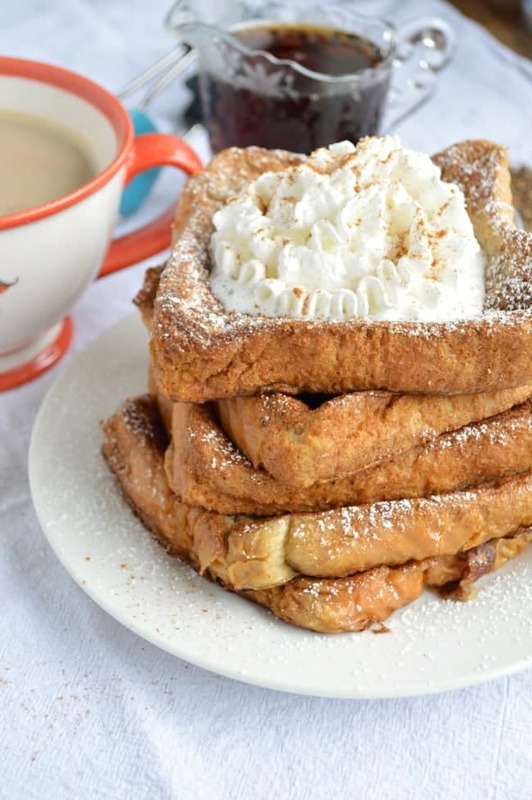 But this Chai Tea French Toast goes cool places none of those other recipes do. Because I INFUSED THE BATTER WITH FLAVOR. What?! I know. I love Chai Lattes — it’s definitely at the top of my favorite drink list. I love them hot, cold, with soy milk, with regular milk, sprinkled with cinnamon, or topped with whipped cream. And so when I got to thinking about my love for those sweetly spiced lattes, so many of the characteristics apply to what I love about french toast. 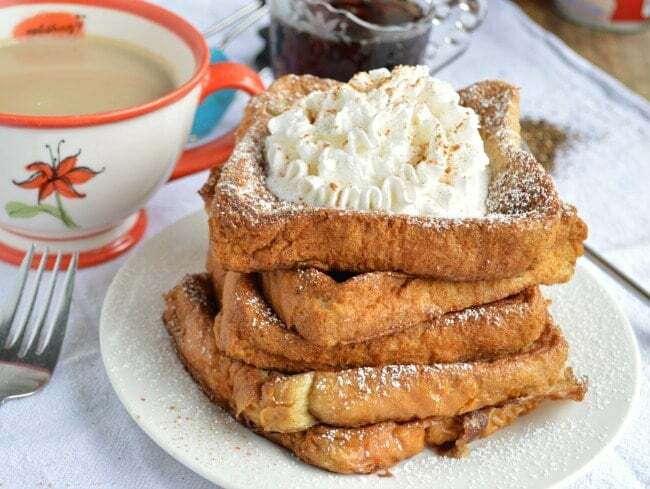 Hot, cold, battered with soy milk, battered with regular milk, sprinkled with cinnamon, topped with whipped cream… chai lattes and french toast are like kindred spirits, I think. I shared my secret for perfect french toast a month or so ago, and I applied all that stuff here. This Texas toast is lightly battered and grilled in butter. The light batter — I mean you really just need to like dip, flip, and be done — is crucial because otherwise the bread can get too soaked and heavy to cook through in a tasty way. A quick note: if you can’t do dairy milk I’d definitely go soy here. 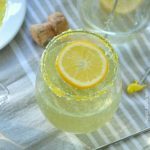 You guys know I love my almond milk and cashewmilk, but when I tested this recipe with it, it was a little bit too heavy. Still creamy but the bread was too weighed down to be battered and light when grilled. So soy milk will be your non-dairy ticket. Bonus! That actually turns it into the breakfast version of my most favorite soy chai latte. If you are wondering how I managed to infuse the batter with chai tea, You need to wander over to Dreamfarm and check out the TeaFu. If you are a tea drinker, this little kitchen gadget is THE BEST!! But Dreamfarm has lots of fun kitchen tools like spatulas that chop and tongs that don’t lay on the counter and make a mess. Definitely gift-worthy stuff. 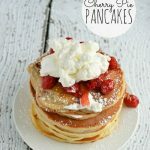 If you’d like to enter to win a Mother’s Day Brunch Giveaway full of great Dreamfarm goodies, CLICK HERE! 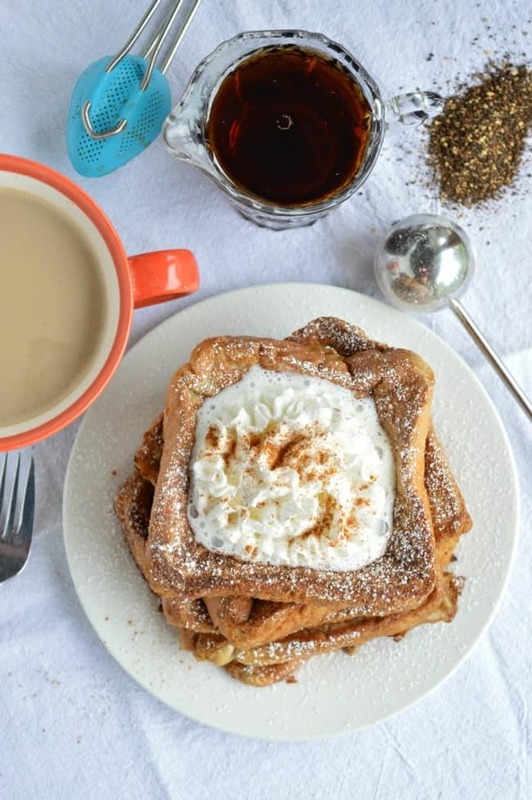 This Chai Tea French Toast will make your mama (or all your brunch guests) happy!